About 6 tablespoons of oil to cook. 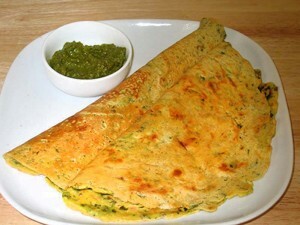 consistency of pancake batter or Dosa batter. Add the green chilies, cilantro, and zucchini. Mix well. Use a non-stick skillet and place on medium-high heat. Test by sprinkling a few drops of water on it. Water should sizzle right away. Pour about 1/2 cup of the batter into the skillet and spread evenly with a back of spoon. Starting from the center, spiral the batter outward evenly to form a circle about 7″ in diameter. BasenKa Puda is a tasty dish for breakfast or a light lunch. This recipe is quick to prepare and can be served many different ways. In my house this is a favorite dish for breakfast, folded with cheese.